Kobo Abe, the internationally acclaimed author of Woman in the Dunes, combines wildly imaginative fantasies and naturalistic prose to create narratives reminiscent of the work of Kafka and Beckett. In this eerie and evocative masterpiece, the nameless protagonist gives up his identity and the trappings of a normal life to live in a large cardboard box he wears over his head. Wandering the streets of Tokyo and scribbling madly on the interior walls of his box, he describes the world outside as he sees or perhaps imagines it, a tenuous reality that seems to include a mysterious rifleman determined to shoot him, a seductive young nurse, and a doctor who wants to become a box man himself. 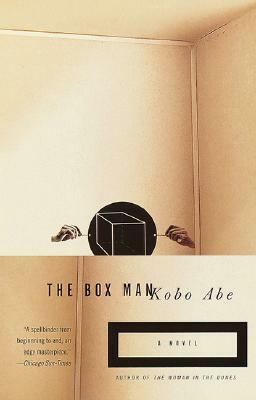 The Box Man is a marvel of sheer originality and a bizarrely fascinating fable about the very nature of identity. Kobo Abe was born in Tokyo in 1924, grew up in Manchuria, and returned to Japan in his early twenties. In 1948 he receiveved a medical degree from Tokyo Imperial University, but he never practiced medicine. Before his death in 1993, Abe was considered his country’s foremost living novelist, and was also widely known as a dramatist. His novels have earned many literary awards and prizes, and have all been bestsellers in Japan. They include The Woman in the Dunes, Kangaroo Notebook, The Ark Sakura, The Face of Another, The Box Man, and Secret Rendezvous.